For many the most interesting item on this week’s City Council meeting agenda was “Harbor View Place Project Environmental Review Scoping Session, Review of Proposed Community Benefits Package and Review of Economic Land Use Study.” I’m not going to go into that particular item this week, largely because although it plays an important part of the future of the Harbor View project (the large office complex being proposed for the Malibu/Lyngso property on the Bay side of Highway 101), it is still very early days for that project. The purpose of the scoping session was to identify just what impacts will be addressed in the yet-to-be-written Environmental Impact Report (EIR). Learning the magnitude of those impacts—something we won’t know until the proposed project is analyzed and the report is actually written—is where things get interesting. These issues will be closely studied for this new Harbor View EIR, as will a number of other issues (the list of required topics for an EIR is fairly long). I’ll go into those in a future post, but because it will take a while just for a draft version of the EIR to be prepared—the City estimates we’ll see it sometime next fall—we have quite a bit of time. Once we see that draft report we can seriously debate the proposed project’s impacts and how (or if) those impacts can be mitigated. In the meantime, however, if you want to suggest additional areas for consideration within the EIR, comments will continue to be accepted up to 5 p.m. on Monday, February 12. Send any thoughts to Lisa Costa Sanders (the Project Planner for this project). You can use email (lcostasanders@redwoodcity.org) or you can mail or hand-deliver them to her at Redwood City’s City Hall. I always make it a point to go through the agendas for both City Council and Planning Commission meetings. While “big ticket” items like the Harbor View Place EIR certainly grab my attention, I also pay close attention to the smaller items. After all, you never know what might come out of them. For instance, this week I found the item labeled “Annual report from the Redwood City Improvement Association Community Benefit Improvement District” to be quite interesting. The RCIA was created to “to fund special benefits beyond normal City services that support downtown Redwood City as the premier entertainment destination on the peninsula.” This association is funded through an assessment paid by each property owner in the district (i.e., downtown), and is charged with keeping our downtown “attractive, clean, safe, and orderly” as well as publicizing Redwood City’s downtown. During the first three years of the RCIA organization, this committee [parking] used their funds to provide the valet parking to downtown guests on weekend nights. Following the installation of the new digital signs at the garage entrances, use of the valet parking significantly decreased and was discontinued. 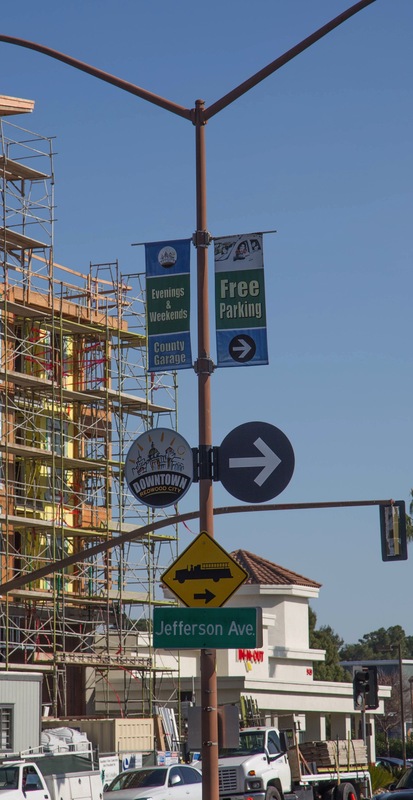 The parking committee is funding a study to determine where to place additional electronic signs to direct visitors into the downtown area and to indicate where parking is available. That study should be completed in spring 2018. As I’m sure you will agree, the digital signs that were added to our parking garages have been a great help in letting people know just how likely it is that they will be able to find a parking space inside. But because they are mounted on or just in front of the Jefferson and Marshall Street parking garages (there is also a digital sign at the front of the garage in the “Box buildings”), they are only useful if you have managed to navigate to those garages. Thus the “study to determine where to place additional electronic signs […] to indicate where parking is available.” I had always assumed that we would be getting signs elsewhere in our downtown that would let people know if and where parking was available, without them having to check each garage first. Presumably that is what we will be getting; the study seems to be about where such signs should go, not if we need them in the first place. 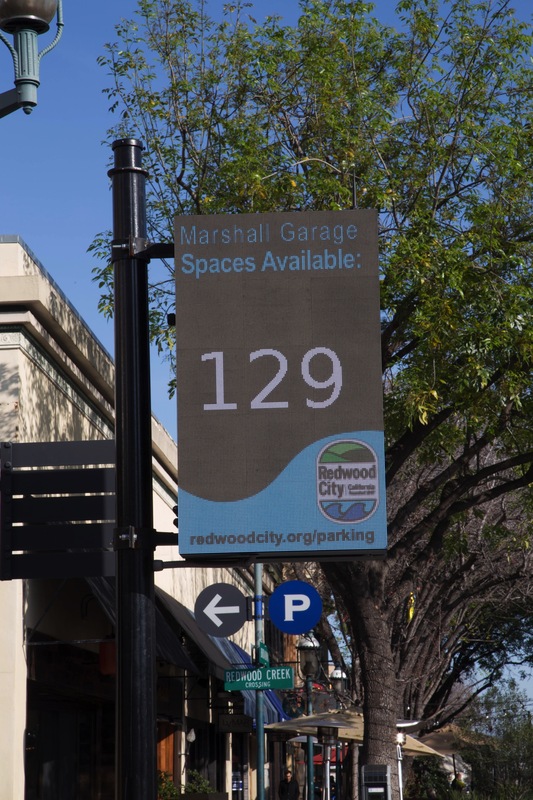 Reading about our parking signs got me to thinking about signs in general, and, more specifically, what kind of signs Redwood City currently uses to direct people to our downtown attractions. Those of us who live in the area and know our downtown well likely don’t pay attention to these signs—I know I don’t—and thus I thought it might be an interesting exercise to force myself to actually pay attention and see just what signage the City provides. Accordingly, this week I took a long walk in and around Redwood City’s downtown, paying almost exclusive attention to signs. Curiously there is one of these at Maple Street; turn there and you’ll only skim the edge of downtown—and there appear to be no additional signs directing you from Maple to anywhere interesting. 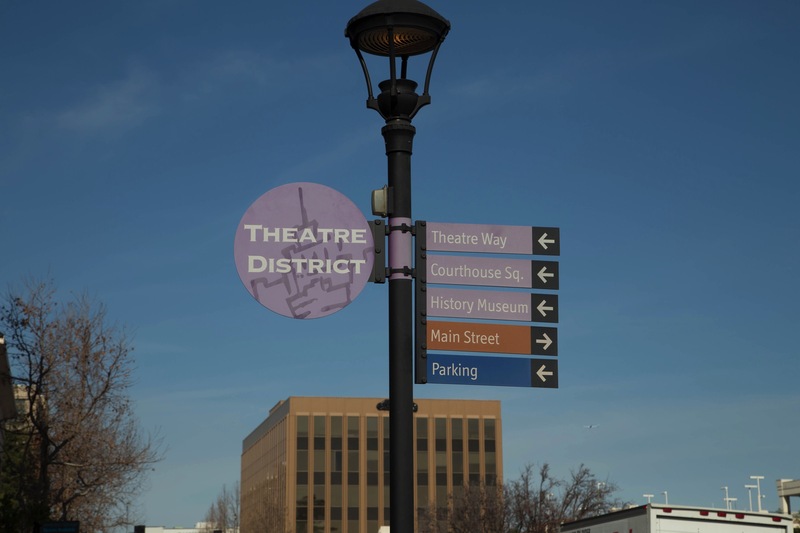 The above-pictured sign not only lets you know that you are in the “Theatre District,” it also directs you to Theatre Way, Courthouse Square, the History Museum, Main Street, and parking. That’s a lot to read as you are driving by. Perhaps the blue coloring on the “Parking” portion of the sign will catch the driver’s eye—although I wonder how many people understand that they should be looking specifically for blue signs when trying to find a place to park. I can’t come up with a good reason why anyone who isn’t driving would need to know where Highway 101 is. And let’s face it: the “Parking” sign just indicates where parking can be found—which is not necessarily where you left your car. So that particular rationalization—that the “Parking” slat could be aimed at pedestrians—really doesn’t hold water. 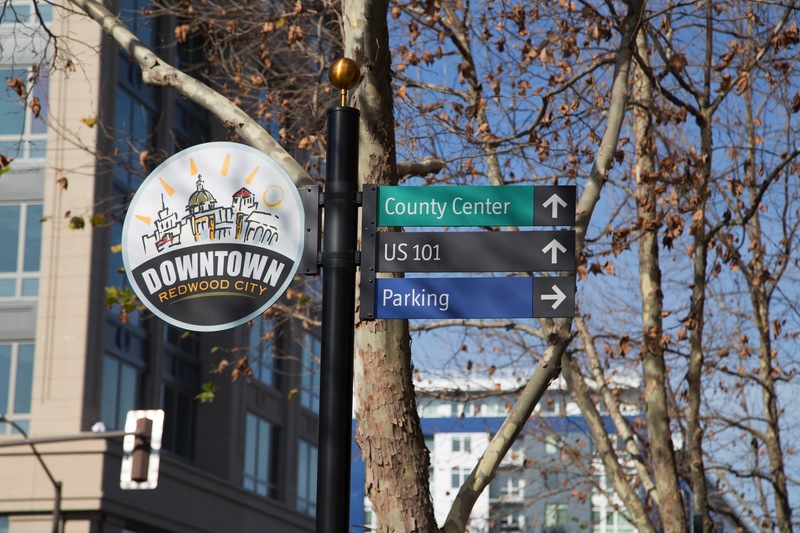 The signs are attractive enough, though, and I really like the Downtown Redwood City logo shown on the circular sign in the above image. There are a number of the circular blue “P” signs directing motorists to parking, but I definitely agree with the RCIA that additional signage aimed at routing drivers efficiently to their desired destination would be helpful. Now I’m looking forward to seeing what signs they come up with. Hopefully we’ll see them soon. 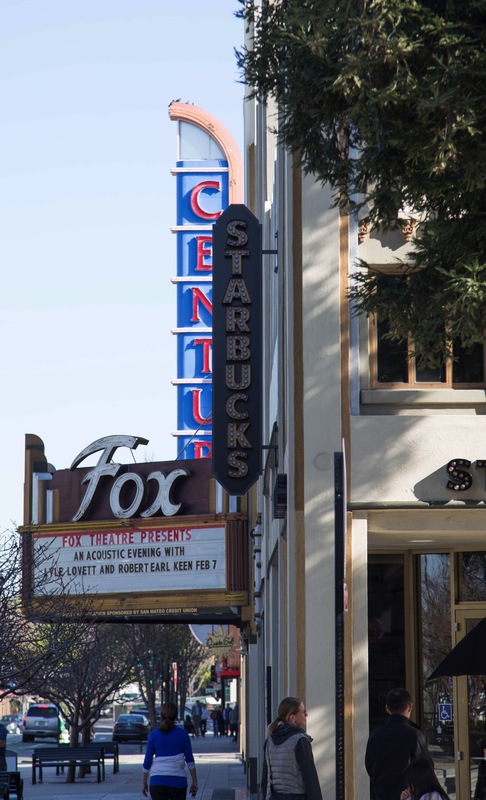 Starbucks had originally hoped to use a much larger version of this sign, but the Planning Commission felt that a larger sign would detract from the marquee in front of the Fox Theatre, which they understandably wanted to be the dominant sign in the area. The sign that Starbucks settled on, though, seems quite nice and is in keeping with the look of our historic downtown. If you aren’t familiar with this project, the historic portions of the building will be retained, largely intact. The second story will be set back from the front, to preserve the building’s historic character. 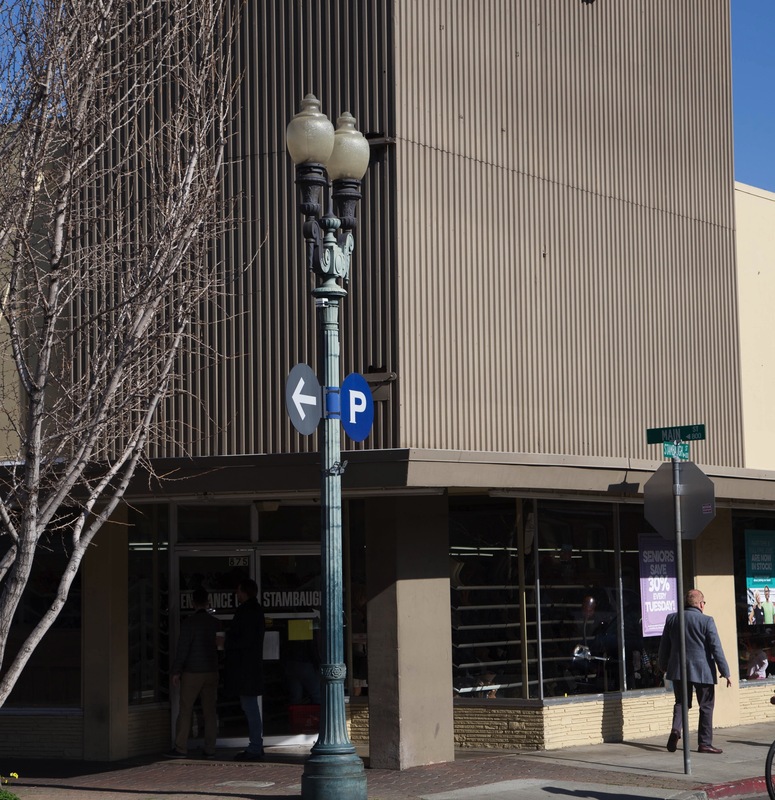 But the usable space will nearly double in size, which should make the retail space much more desirable, and the area above the historic front part of the building will be fitted out as a terrace, making this space attractive as possible restaurant location. 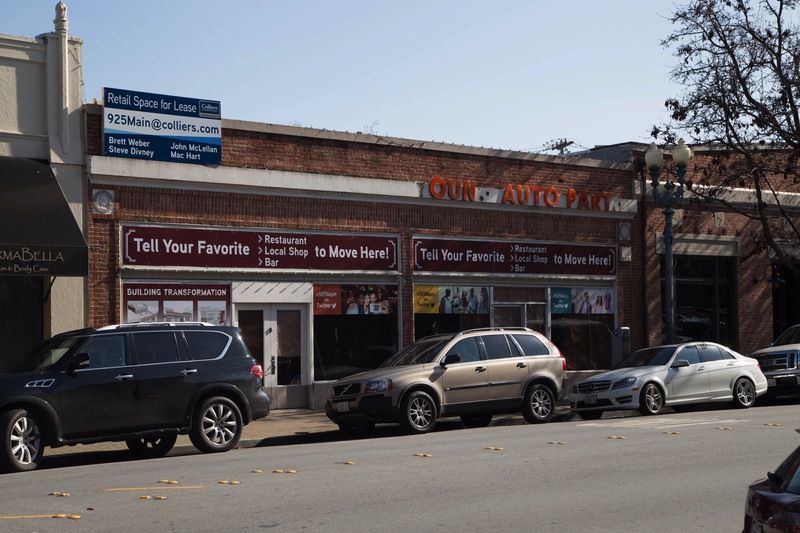 I do like how the developer is using the front windows and sign space to not only show off what the building will look like in the near future, but to encourage all of us to bring the site to the attention of our favorite restaurants, bars, and retail shops. This seems far better than the usual brown paper that is used to block up building windows during a major remodeling project, don’t you agree? The sign above the doors says it all: Pasha Mediterranean opened for business this week. Workers were still doing a bit of touch-up when I went by—the ladder you can see in their outside seating area was being used by a sign painter who was working on the orange lettering you see on the building’s side—but I noted a few customers sitting both inside and in the patio area. A word about that patio: apparently it is a “Hookah garden.” That will likely turn a number of people off (myself included, I will admit) but will also probably attract a select few. Hookahs are limited to the outside patio, however, so I for one will likely still give the place a visit—but I’ll sit inside. 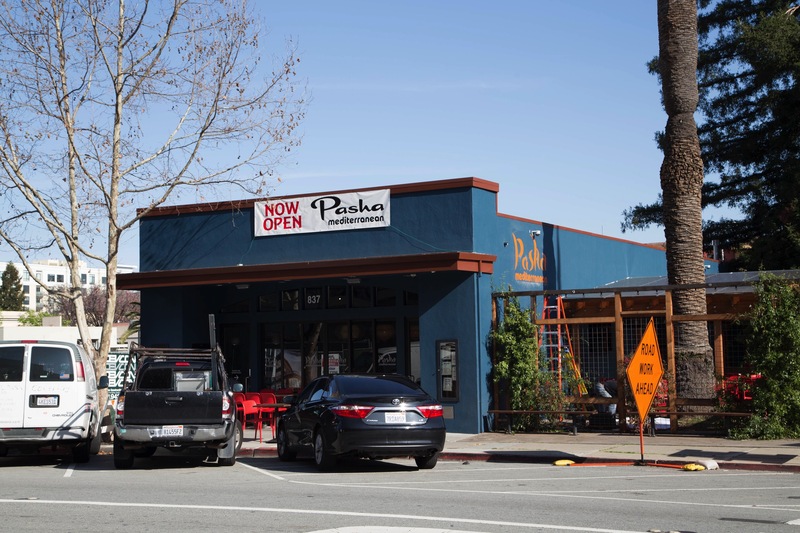 Pasha’s menu is a bit eclectic: in addition to the standard Mediterranean fare Pasha also serves pasta and pizza—and their menu lists a hamburger with french fries. I should note that the handful of visible reviews I saw on Yelp (there are a couple that Yelp hides as “not recommended”) are all five-star, which strike me as a tad suspicious. Personally I’m going to give them a couple of weeks to get into their groove before paying them a visit. If you go there before I have a chance to report back, do submit a comment here to let all of us know what you think. It’s a so-called Intelligent Transportation System (ITS) project, designed to improve mobility along Hwy 101, located along predefined designated parallel arterial routes connecting Highway 101 to El Camino Real including but not limited to SR 82 (El Camino Real) between I-380 and the Santa Clara County line. 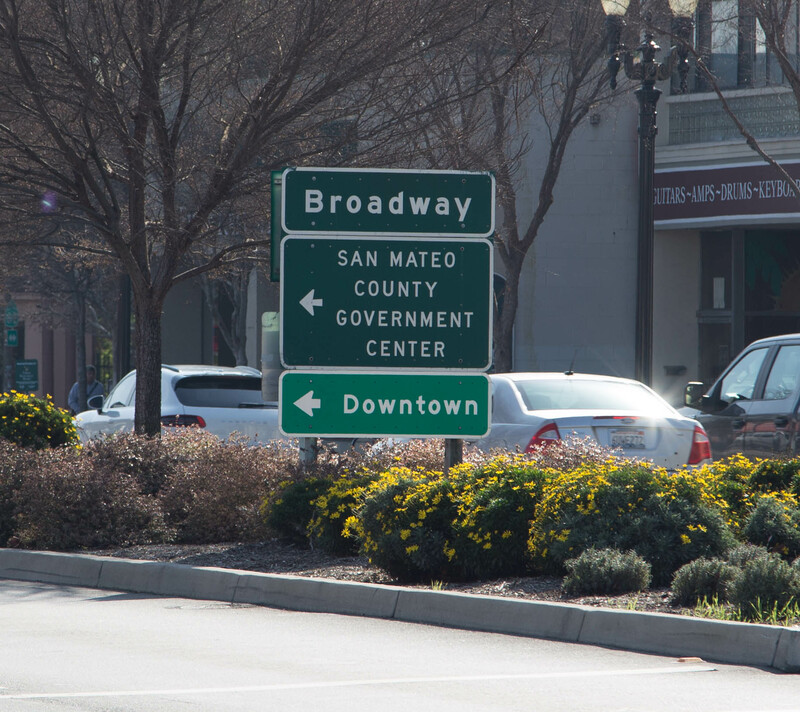 Hi, and thanks for all the interesting things about Redwood City. When I first saw that this one was about signs I thought that finally my question would be answered! But no? But i’m hoping you do know. I have seen these green signs, about 3 feet by 4, that has the highway 101 symbol on it ( I think there might have been one with ‘to 101’) but also there is an electronic sign board above it. They are on Whipple as well as El Camino and a few other streets. I saw one being installed, and asked the guy what they were for,but he didn’t know. Are they part of an emergency system? I’ve never seen the board lighted up and they don’t really point to 101. They are indeed part of an emergency system. I actually wrote about these signs when they first appeared, back in 2013. Adrian’s response is correct, but if you want to see what I wrote about them back then, check out my post “Timely Observations” (https://walkingredwoodcity.com/2013/08/23/timely-observations/). They are intended to reroute traffic in the even that part of 101 is shut down; traffic can be taken off 101, sent down El Camino, and then, with the help of these signs, put back onto 101.